Skulen (or rarely Skolen) Hasidic dynasty was founded by Rav Eliezer Zusia Portugal. It was headed by his son, Rav Yisroel Avrohom Portugal until his death on 1st April 2019. Name is originated from Sculeni (Yiddish: סקולען Skulen), a town in Bessarabia where Rabbi Eliezer Zusia was born and served as rabbi. Rabbi Eliezer Zusia succeeded his father as rabbi of Skulen at the age of 17 upon his father's death in 1915. Thereupon he became a disciple of the rebbe of Bohush (Buhusi, Romania), a scion of the Ruzhiner dynasty. Before the outbreak of World War II, the rebbe moved to Chernowitz. He survived the war and moved to Bucharest, the capital of Romania, where he opened an orphanage for the orphans left after the Holocaust. When the Communists took over Romania, it became dangerous for him to continue to educate the children in the ways of Judaism, yet the Rebbe continued unabashed. In 1959, the Communists arrested the rebbe and his son, the present rebbe, for teaching religion and for supporting and educating orphans. The Rebbes of Sadigura, Kopishnietz and Boyan led an international effort to free the Skulener Rebbe and his son, and eventually, Rabbi Eliezer Silver at the request of the Lubavitcher Rebbe succeeded in securing the release through his connections in Washington and the Rebbe and his son were freed and immediately immigrated to the United States in 1960. Upon moving to America the rebbe continued his works helping the underprivileged and began an international charity organization known as Chesed L'Avraham. The Rebbe authored Noam Eliezer and Kedushas Eliezer, and composed many popular Hasidic tunes. He died in 1982 and was buried in the Viznitzer Cemetery in Monsey, New York. He was succeeded by his son, Rebbe Yisroel Avrohom Portugal who continued his father's work by by running the Chesed L'Avraham organization to help the needy in the Holy Land and around the world, and wrote many Hasidic tunes. The Rebbe died on the 1st April 2019 in Johns Hopkins Hospital surrounded by his family. He was Succeeded by his son Reb Yeshaya Yakov Portugal , the Third Skulener Rebbe, long may he reign. Other sons of Rebbe Yisroel Avrohom Portugal lead the Skulener communities in Williamsburg, Monsey, In Lakewood NJ his son Horav Zvi Noach who was previously the Rav of the Lakewood Kehilah was crowned as Skulen Rebbi of Lakewood. The central Skulener synagogue is located on 54th street in the Boro Park section of Brooklyn, New York, near 13th avenue. Bohush is a Hasidic dynasty named for the town of Buhuși, Romania. The dynasty began in the mid-nineteenth century with Rabbi Yitzchok Friedman of Bohush, the eldest grandson of Rabbi Yisrael Friedman of Ruzhyn, and was based in that town until 1951, when his great-grandson, Rabbi Yitzchok Friedman of Bohush-Tel Aviv, moved the dynasty to Tel Aviv. In 1987 the Bohush beis medrash was transferred to Bnei Brak, where the dynasty is led today by Rabbi Yaakov Mendel Friedman, a great-great-grandson of the first Bohusher Rebbe. Rebbe Yisrael Baal Shem Tov (1698-1760) - the founder of Hasidism. Rebbe Yechiel Michel - the Maggid (Preacher) of Zlotshov (d. 1786) - disciple of the Baal Shem Tov. Rebbe Mordecai of Kremnitz - son of the Maggid of Zlotshov. Rebbe Yeshayah Shor of Yas - author of K'lil Tiferes  - disciple of Rebbe Mordecai of Kremnitz. Rebbe Yisrael Avraham Portugal (d. 1915) of Skulen - author of Shem uSh'aris Yisrael - disciple of the K'lil Tiferes. Rebbe Eliezer Zusia Portugal of Skulen (1898-1982) - author of Noam Eliezer - son of the Shem uSh'aris Yisrael, disciple of Rabbi Yisrael Shalom Yosef Friedman (1863-1923), of Bohush and Rabbi Mordechai Shalom Yosef Friedman (1886-1979), of Sadigura. Rebbe Yisroel Avrohom Portugal of Skulen - (1923-2019) - son of the Noam Eliezer. Israel ben Eliezer, known as the Baal Shem Tov or as the Besht, was a Jewish mystical rabbi from Poland, who is regarded as the founder of Hasidic Judaism. "Besht" is the acronym for Baal Shem Tov, which means "Master of the Good Name" or "one with a good reputation". Zlotshov is the name of a Hasidic dynasty founded by Rebbe Yechiel Michel, a disciple of the Baal Shem Tov, the founder of Hasidism. Zlotshov is the Yiddish name of Zolochiv, a town in present-day Ukraine. Yechiel Mechel's five sons all founded their own branches of the Zlotshov dynasty. Descendant dynasties include the Zvhil, Skolye, Zvhil-Mezhbizh and Shotz dynasties. Kremenets is a city of regional significance in the Ternopil Oblast (province) of western Ukraine. It is the administrative center of the Kremenets Raion (district), and lies 18 km north-east of the great Pochayiv Monastery. The city is situated in the historic region of Volhynia. Karlin-Stolin is a Hasidic dynasty originating with Rebbe Aaron the Great of Karlin in present-day Belarus. Karlin was one of the first centres of Hasidim to be set up in Lithuania. Zvhil is the name of a Hasidic dynasty which originated with Rabbi Moshe of Zvhil, the son of Rabbi Yechiel Michl, the Magid (Preacher) of Zlotshev. He was also the grandson of Rabbi Yitzchok of Drubitsh and Rabbi Aharon of Karlin. As in several inter-related Hasidic dynasties, family tradition held that Rabbi Moshe was a descendant of King David. Yisroel Avrohom Portugal son of Rabbi Eliezer Zusia Portugal and his first wife, Sheina Rachel, was the Rebbe of Skulen in Brooklyn, New York. He was the last Holocaust era Rebbe to lead a Hasidic sect. Machnovka is a Hasidic dynasty and part of the Belz and Chernobyl dynastic group of families. 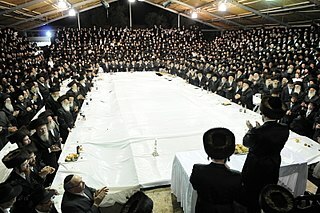 Moetzes Gedolei HaTorah is the supreme rabbinical policy-making council of several related prestigious Haredi intra-national organizations. Izhbitza-Radzin is the name of a dynasty of Hasidic rebbes. The first rebbe of this dynasty was Rabbi Mordechai Yosef Leiner, author of Mei Hashiloach, in the city of Izhbitza.. Rabbi Mordechai Yosef founded his own Hasidic movement in the year 5600 (1839), with Rabbi Mordechai Yosef leaving the court of Rabbi Menachem Mendel of Kotzk. Kozhnitz is the name of a Hasidic dynasty founded by the Kozhnitzer Maggid, Rebbe Yisroel Hopsztajn. Kozhnitz is the Yiddish name of Kozienice, a town in present-day Poland. Shtefanesht was a Hasidic dynasty named for the town of Ştefăneşti, Romania. It was one of the branches of the Ruzhiner dynasty, together with Bohush, Boyan, Chortkov, Husiatyn, and Sadigura. The dynasty lasted from 1851 to 1933 and had only two Rebbes: Rabbi Menachem Nochum Friedman, a son of the Ruzhiner Rebbe, and Rabbi Avrohom Mattisyohu Friedman, the only son of Rabbi Menachem Nochum. During the latter’s reign, Ştefăneşti became one of the most important Hasidic centers in Eastern Europe. Kerestir is a Hasidic dynasty founded by Rebbe Yeshaya Steiner. Kerestir is the Yiddish name of Bodrogkeresztúr, a town in Hungary. Reb Yeshaya lived at 67 Kossuth Utca the house still serves today thousands of people annually. Skolya is a Hasidic dynasty named after the town of Skole in Eastern Galicia, where the founder of this dynasty lived and led his court. Radomsk is a Hasidic dynasty named after the town of Radomsko in Łódź province, south-central Poland. The dynasty was founded in 1843 by Rabbi Shlomo Hakohen Rabinowicz, one of the great Hasidic masters of 19th-century Poland. His son, grandson and great-grandson led the dynasty in turn, attracting thousands of followers. On the eve of World War II, Radomsk was the third largest Hasidic dynasty in Poland, after Ger and Alexander.